I have often said that education has the power to transform the world. After the incredible week we had at the 2014 Microsoft in Education Global Forum in Barcelona, I know this adage could not be more true. Over 1,100 educators, school leaders, government officials, education leaders and students from 97 countries gathered together to share innovative ways to harness the power of technology, all for the betterment of education. It was indeed transformative for me, and I hope for everyone involved. The Microsoft Expert Educators Individual project Competition: Prior to the Forum educators created project based learning activities that exemplified 21st century teaching practices. These included a rubric and examples of student work. 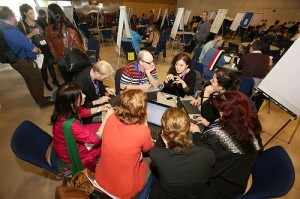 These activities were evaluated by a panel of judges. This year’s categories and winners were Collaboration (Darko Taleski / Sofija Grabuloska, Prilep, Macedonia), Knowledge Construction and Critical Thinking (Ammani Jeya Pirathaba – Johor, Malaysia), Learning Beyond the Classroom (Jose Luis Alvarado Aguilar – Complejo Educativo Claudia Lars, El Salvador), Cutting Edge Use of ICT for Learning (Paula Vorne – Maikkula Comprehensive school/Patamäki u, Finland), and Teacher as Change Agent (Shimaa Ismail – Bani Mazar Industrial School for Girls, Egypt). You can learn even more about their projects, the runners-up in each category right here. 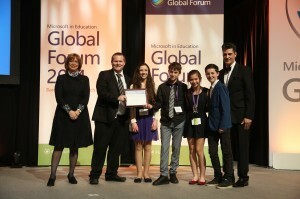 The Microsoft Innovative Schools Pitch Competition. For the first time, we invited six schools to present their ideas on transformational teaching to our esteemed panel of judges. The winners received a share of $50,000 to implement their ideas, and the support of YouthSpark to make their visions a reality. I’ll share even more next week on Daily Edventures, but until then, check out this great video that captures the excitement of the competition. 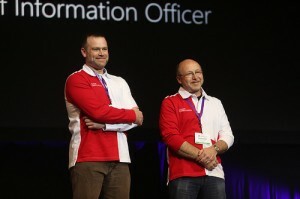 You can also read more details about the projects on the Microsoft Citizenship blog. Technology Showcase: Technology does enable education transformation, but all technology is not created equal. 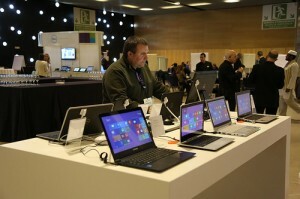 That’s why we were proud to feature the Technology Showcase at this year’s Global Forum. With Pearson, Promethean, Acer, Intel, Dell, School Improvement Network and other top global partners showcasing the best of education technology, our attendees were able to see it in action, and perhaps most important, discuss benefits and challenges with their peers. You can see even more about the Technology Showcase here. 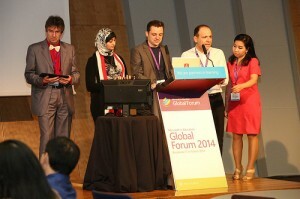 The Saltash.net Students: For the first time ever at the Global Forum, students played a starring role. Additionally to students from SEK Catalonia and ESADE Business school, four students from Saltash.net Community School participated in the Global Forum in numerous ways. More specifically those four students presented their ideas to ministers of education, school leaders and teachers, judged awards, provided guidance for teachers, and launched a worldwide student leadership project for schools all over the world. They also won an award (second runner-up, with their teacher Scott Wieprecht, in the Cutting Edge Use of ICT for Learning category). George, Amy, Jack and Rowenna – who call themselves the @OffPerts – congratulations for your hard work and inspiration you shared with all of us! I was lucky enough to interview them, and you will be hearing much more from them right here. This past week was jam-packed with so many great events, it is impossible to talk about each of them here. However, you can view hundreds of photos from the event, or watch some of the many videos from the event – including a short extract of my keynote speech that kicked off the week. We were fortunate to be joined by Felipe, Prince of Asturias and Girona, in the closing keynote . He shared our conviction that teachers, students and parents will all benefit if they develop the skills necessary to keep up with today’s rapid pace of change. 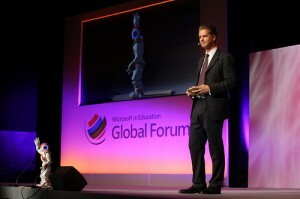 Todd La Vogue, a Daily Edventures alum and winner from the 2012 Global Forum, summed up my feelings of the week in a tweet he sent: “I love learning with the world!” Without a doubt, last week’s Microsoft in Education Global Forum in Barcelona was an inspiration. We will continue to share videos, interviews, photos and stories in the coming weeks here on Daily Edventures. I’d also love to hear your thoughts. What did you like best? What did you find the most inspiring? Who did you learn from? Let me know @anthonysalcito. This entry was posted in 21st century skills, Beyond the Classroom, Building Teacher Capacity, Change Management and Culture of Innovation, Entrepreneurship, External Videos, Information, Leadership and Strategic Innovation. Bookmark the permalink. 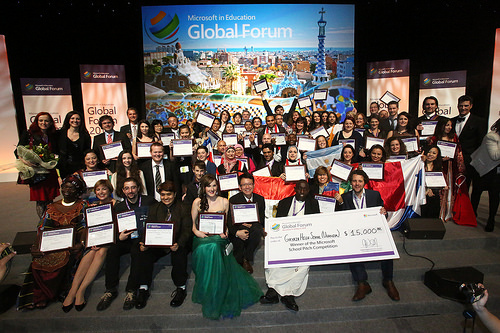 I felt really inspired to be in Microsoft in Education Global Forum-2014. A great platform for educators like me to gain some expertise. Feel blessed and i am greatful to Microsoft for providing such an life time experience. Microsoft – not technology giants but also pioneers in bringing technology to the classroom, thus enabling real life experience an develop 21 century skills to tomorrow’s leaders.